The Travel Smart Series is written by Chika Okoroafor, an immigration lawyer based in Nigeria. To see our very first interview with her, click here. I partner with her to produce the series so as to create awareness of the legitimate means available for those who wish to travel abroad. We hope this effort will help reduce the epidemic of human trafficking which results when desperate Nigerians try to migrate to other countries illegally. For a while now I have been trying to finish a post on International Investment for foreigners who are interested in investing in Nigeria and for Nigerians who are interested in investing abroad. It ought to have been posted weeks back but somehow other topics have kept it in the shadow. I was determined to finish it and finally get it out this week but I am afraid that won’t be the case. Today’s post is inspired by interactions I had with two individuals who contacted me independently, via this medium. Although they had different stories and plans, I realised that at the end of the day, to each, I was making similar submission as to the other. I realised that even with some variances in their individual facts, they share the same fundamental defects, hence the similarity in the solution I proffered. Before I go into the main discussion please permit me to digress a little. Earlier this month, it was reported that Italian authorities recovered the corpse of 26 female Nigerians (some as young as 14), illegal migrants who died in the Mediterranean sea while crossing into Italy from Libya. 375 other migrants were rescued and according to The Guardian, most of the survivors were either Nigerians or from other Sub-Saharan countries including Ghana, Sudan and Senegal. It was also reported that these migrants were victims of trafficking for sexual exploitation. About a week ago, I watched on TV the mass funeral and burial ceremony given to the 26 deceased by the Italians during which Nigerian officials were conspicuously absent. There are arguments that there are no proofs that the 26 were (all) Nigerians. To me this is the most pathetic excuse and totally irrelevant. Human trafficking, especially women trafficking, has been a menace in our country for God knows how long. Our Government, however, is yet to take definite action or take a firm approach towards putting an end to it. Because the routes and tactics through which this evil is perpetrated are well known, we don’t need a rocket scientist to proffer a permanent solution to end this inhumane act. So the question is: Why is human trafficking still alive and well in our country? If you think corruption, well, your guess is as good as mine. However, it will take the most deviant in heart to look the other way, while young female children are being trafficked. I implore every one of us to please be our brother’s keeper. Most of these girls are taken involuntarily. Let us report to relevant authorities immediately, if we suspect anyone or group of person to be perpetrators. May God help us and all of ours. To our main discussion for today, we will be looking into the relevance of a good immigration/travel history vis-a-vis issues presented by the two individuals I interacted with earlier this week. Client A is a soft-spoken young man, single, in his early thirties. He earns a modest income working for a reputable organisation; he is also an entrepreneur with strings of businesses here and there. For the past five years until quite recently, he could boast of a net worth of about Fifty Million Naira (N50, 000,000). Like most businesses in Nigeria, he’s also suffered some challenges that led to a drastic fall in his net worth in recent time. He contacted me because he is desirous of exploring prospective international contacts, in Canada, for some business prospects. Unfortunately for both clients in the scenarios above, in my humble opinion, based on their current circumstances, chances that they will be granted visas on their application for a visitor’s visa to the destinations they seek is quite narrow and thus not advisable. It’s most unfortunate that both of them could have built an excellent travel history if they had made use of their immigration/travel opportunity peak period. Do you know when your travel opportunity peak period is? Are you making use of it? Are you developing your immigration/travel record? Perhaps this post will gain you some enlightenment about why your response to the above questions ought to be in the affirmative. In assessing a client for financial eligibility, I always request for client’s current six months financial record, in other words, bank statement(s). For Client A, it can easily be deduced from his bank statement that presently his financial circumstance is in distress because there is a great disparity in turnover from previous months and the later months. Because client A is single (no family ties) he has only his financial circumstances to establish reasonable ties. Establishing ties in home country is a prerequisite factor for the grant of a visitor’s visa. Clients A’s financial statement from a year ago (2016) was impeccable, great turnovers and stable income flow and it would have made an excellent document to build his immigration/travel records on. But it’s a typical average Nigerian mentality (especially those of us from the Eastern region of Nigeria) of those who are relatively financially well off, but see traveling as waste, except there is an immediate financial gain attached. We fail to see the greater picture, which is that in the business world, to grow is to continuously explore and expand; nothing in life, business, technology, science etc is static. If you don’t grow, sooner or later, you become obsolete. A little bit of advice to us: No matter how palmy our present business, job, career maybe at the moment, we shouldn’t get too comfortable in a particular spot no matter how good it may seem at the moment. It pays to keep exploring ways to do more, know more and keep being better. In whatever we do, we should avoid being monotonous at all cost. Another hitch in Client A’s path is his country of interest. The Canadian high commission, from my practical experience in this line of business, is what we term as “not first-timers friendly”. There are some diplomatic missions who are very skeptical about “visitors” with zero travel record. So I would not ordinarily (they are few exceptions though) advise a client to apply for a Canadian tourist/other visitors visa if such applicant had not previously been to United States. However, Client A’s case is redeemable. To Wait: First, he has to tidy up his financial. He will run a separate account for his salary and another account for income from side his hustle. His business account will be allowed to phase out the previous financial activities so in another couple of months, his future six months statement will read a stable revenue flow albeit a more moderate turnover. Financial eligibility is not all about huge turnovers but financial consistency/stability. On a zero immigration/travel history and in the absence of a specific special visitation grounds, I will not advise him to apply to Canada first. I suggested a couple of “first-timers friendly” diplomatic missions where ceteris paribus, his application as a first-timer will stand a good chance. After he has made a couple of trips, then he may approach the Canadian High Commission. About Client B, being an unemployed adult (above 18years) he is most likely to be viewed by any entry clearance officer assessing his application as an economic migrant and hence ineligible for a visitor’s visa. His parents’ sponsorship and the fact he has an invitation of family /friend who are legal residents of host country notwithstanding. Assessment is first and foremost individual-based. The simple summary of client B’s individual assessment will reveal an unemployed adult, poor financial status, zero ties to home country. However a few years back, when Client B was still a minor and perhaps in secondary school, an application for visitor visa would have been granted, why? He was a minor dependent on his parents’ financial status and his tie would be his educational status in his home country. In that scenario, as long as his parents could afford to sponsor him, and every other thing being equal, he is eligible to be granted entry permit. Client B’s parents would have taken advantage of his secondary school study period to build an immigration record for him by simply taking him along a few of their numerous previous trips abroad. As little as three trips to UK can earn an applicant privileged to a five year multiple entry visitor visa. The US embassy grants eligible applicant 2 years multiple entry visitor’s visa renewable via drop box (the drop box options is not an absolute right though). In other words if Client B had taken advantage of his immigration/travel peak period ( in this case while he was still in school), chances are that he may, like his parents, have valid visas/entry right at the present and there would not have been any need to approach the diplomatic missions. All he would have needed would be tickets to his destination and bon voyage. To wait till he has proof of reasonable ties. In this instance, the easiest evidence of ties for client B to develop is academic pursuit. He needs to get into school (University) and while in school during school holiday he may start developing his immigration/travel record. Except he intends to change his visa route say from visit to study, then it’s a different procedure one which may not necessarily need evidence of an ongoing academic pursuit. Since the trip is merely for Client B’s amusement, I suggested tourist location within Nigeria top on my list (Obudu cattle ranch in the beautiful state of Cross Rivers) or other regions where visa processing is not strict or visa free. The suggestions may not be as glamorous or exciting for client B as what his parents had promised but my job is to give advice from list of options, that which will suit client’s best in any prevailing circumstances. And like folks around here would say; at all, at all, na em bad pass or in other phrase; half bread is better than nothing. Moral of today’s post: if /when you can afford it, please do develop you immigration/travel record. You may not necessarily be a chronic traveler to do this. As little as one trip a year or one in two years, strategically planned, may be all you need. The important thing is to create a bridge between yourself and countries of interest. On the long run you will discover it is worth it. This advice is most useful for us in Nigeria and other 3rd world countries. Most of our local industries are constantly playing catch up with contemporaries in countries in the 1st world. If we are to retain relevance in any field and perhaps dare to top local competitors, we have to have access to the right information and contacts globally via attending conferences, trade fairs, trainings, short/long course etc; hence the essence of a healthy immigration/travel history. I hope today’s post resonates with someone. If you want to know when you are at you immigration/travel peak or wish to start or develop your immigration/travel record, we are available to advise, guide and assist in any way we can. Who says you cannot mix business with pleasure? When you travel smart, you can turn a holiday to business prospects (without breaching your visitor’s visa conditions). When you travel smart you can eat your cake and have it. Thank you for your mails. Like I mentioned earlier, this post was inspired by your inquiries and I hope to draw more inspiration for future post from your emails and comments. As usual, inquires at the comment session will be promptly attended to. Private inquiries are welcomed too at attorneychika@gmail.com. The Travel Smart Series is guest-posted by Chika Okoroafor, an Immigration Lawyer based in Nigeria. See our interview with her here. Since the last publication on the UK tier 2 work visa, our mail box has been swamped with inquiries from interested parties. Unfortunately, other than Nurses and Midwifes, we do not have the contacts yet to help other professionals whose skills are enlisted on the Tier 2 occupation list and Tier 2 shortage occupation list. We are still working on making contact with more human resource companies in the UK to cover more fields in order to be able to give our teeming clients of various professions the opportunity of getting job offers and placements in the UK. As we have learnt from the previous post, a Job offer is a mandatory requirement for accessing a Tier 2 visa. However, other professionals whose skill sets are enlisted in the tier 2 occupation lists can solicit the help of family and friends in the UK to seek out possible employment or scuff the net for job opportunities by themselves. Google is always very helpful in this regards. You may also register with UK-based human resource companies. Just be sure to do your due diligence. There may be some registration fees to be paid, but be certain it’s a reputable organisation before parting with your money. For nurses and midwives, NMC (Nursing and Midwifery Council) is the professional body in charge of nurses and midwives in the UK. It is mandatory that anyone who intends to work in the nursing and midwifery profession in the UK register with NMC and get necessary certifications. Please Note: Pearson VEU test is an online Computer Base Test (CBT). For all the requirements for registering with NMC, please see this link. We will only come in after an applicant has successfully registered with NMC. Our duty will be to link applicants to available job offers via our contacts in the UK. We will also provide guidance and visa packaging assistance. We have come up with some solutions. Issue 1 can be resolved by using a dollar (USD) debit card. You must have a USD account to have a USD debit card or you can get someone who has to make payment on your behalf. With regards to all the above challenges, we decided that an applicant may approach us to assist with the registration with NMC for a minimum service charge. Applicant will provide necessary information and funds for registration so we can make payment on their behalf. I hope this post helps with our collective inquiries. If not, please rewrite us or you may post your question on the comment section and will promptly respond to you. Thank you for inspiring us with you mails, comments and shares. P:S. As stated above, while ideally, we come in after an applicant has registered with NMC, for a small fee, we are willing to guide applicants who need assistance to register with NMC. This post is part of the Travel Smart series written by Chika Okoroafor, an Immigration lawyer based in Nigeria. 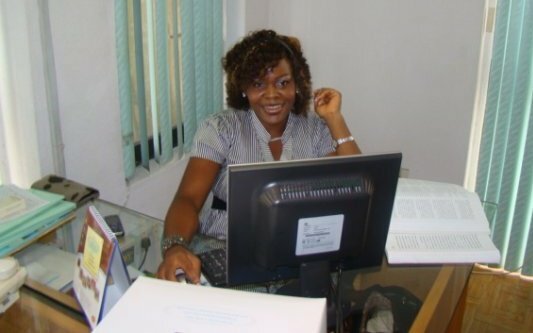 To get a glimpse into the wonderful work she is doing helping people who want to leave (whether permanently or temporarily) Nigeria’s shore, read our interview with her here. Hello everyone, please get in here. This article promises to be an interesting yet educative read. Look around you, someone you know is thinking about traveling outside Nigeria. It could even be you. If you are not thinking about it today, you will probably be tomorrow. By nature, we are inquisitive and adventurous beings in constant pursuit of knowledge. With the exception of Agoraphobics, I believe that we all are Christopher Columbus in some way. I love to travel. For me, traveling is educative, therapeutic, ethereal, fun, and so much more. For me, traveling is living. The beauty of nature can never be aptly defined in words, nor ideally qualified by adjectives. One needs to experience it. In my university days, I was a member of Junior Chambers International (JCI for Short). The highlight of my membership with this amazing association was that we traveled a lot, locally and internationally, attending workshops, seminars, trainings, conferences etc. Before I graduated, through JCI, I visited 21 out of 36 states in Nigeria ( I have since covered more local and international states). I had fellow Jaycees who covered more states and traveled around the globe while in school. In those days, as a student my funds were very limited. My parents’ priority was to provide the basics; any extracurricular expenses had to be scraped out from whatever was left and where nothing could be scraped, a little mathematics came very handy. Ever heard of the the 101, 011 or 001 formula? Foregoing one or several of the three meals a day to scrape by. When it comes to traveling, passion always comes before price. Passion always finds a way, for what wouldn’t one do for passion? So I gave up meals to save for a trip. Some sites are priceless, top on the list from my JCI adventure days was traveling the devil’s elbow of the Obudu mountains enroute the famous Obudu cattle ranch; the drive up the mountain is my must trepidus and exhilarating experience yet. Other scenery included the beautiful landscape, rural and cultural preserve of Ilara Mokin in Ondo State, Yankari game reserve in Bauchi state, Olumo rock Abeokuta etc, not discounting friends made along the way who turned family. Traveling teaches love and tolerance; perhaps that accounts for my unique perspectives of life, one of which is we are all people irrespective of where we come from. Are you conceited and tribalistic ? A healthy dose of traveling will do your soul some good. Pardon the derail, this article is about international travel via the visitors’ entry permit platform. Visitors’ Visa is an entry clearance permit granted by a diplomatic mission to a foreigner/ alien according its holder a right to enter its country albeit temporary for a particular purpose and for a stipulated time frame. Visitors applications are the most applications diplomatic missions receive. It’s also the most abused visa. Holders of visitors visas, by regulation, are expected to strictly adhere to the purpose for which visa was granted ab initio. There are plethora of visitors visas, differentiated by purpose of visit e.g. family visitors visa, tourist visitors visa, medical visitors visa, sport/entertainment visitors visa, business visitors visa, study visitors visa etc. A diplomatic mission may merge a couple of these visitors visa in one clearance permit eg. US B1/B2 covers family, tourist, and business visits while UK standard Visitors Visa covers family, friends and tourist visits. Where a visa stands on its own, its application has to be strictly for the purpose it was issued. For instance, if an applicant is granted visa as a tourist, they are not expected to work, rely on the host country’s public welfare packages like free medicals, school etc. Such indulgence will be a breach of visa regulation and if caught, visa will be revoked and there may be further consequences like a ban. Another important aspect of a visitor’s visa is tenure. Before visitors visa is issued, an applicant has to specify the duration of stay. The fact that a diplomatic mission issues more time than applied for, does not automatically confer on applicant right to stay beyond reasonable time. For example, Mr X, a first-time applicant, applied to UK diplomatic missions for a standard visitors visa to visit a friend or for holiday, specifying duration of stay to be two weeks. If found eligible, UK will issue him 6 months multiple entry permit. This length of visa granted does not translate to a right to stay. It is, at the most, tenure bestowed in trust extended to Mr. X to use bona fide, for subsequent visits. That is why it is a multiple entry visa. Even where six months visa is granted at single entry, applicant is still expected to adhere to purpose and duration stated in his application. Most often, people and/or “agents” gamble with their application, using the correction through error approach where they assume that what works for A will work for B. For instance: A and B work in the same organization, earn the same salary (or B may earn more). A applied for visitors visa and was granted, B did same but was not so lucky. I would be a millionaire if I have a penny for every time I hear this remark “ I did the same thing A did, I earn more, yet I was refused” or “ how come my junior(s) are always successful with their application and I have been repeatedly refused”. Well all I know is that just like in gambling, you win some, you lose some. Dear readers, please note that visitors visa regulation is based on individual assessment. That you work in the same organization, earn the same income as a colleague who has been assessed eligible does not confer the same status on you. Financial assessment is not limited to income, your financial encumbrances vis a vis your income is also considered. Using the scenario above, A may be single or married and his wife may also be gainfully employed, while B who may be earning more than A, is also married, his wife is a homemaker, he has two children in school, aged parents etc. From the evidence of his financial statement presented, it will be obvious that his income goes as soon as it comes in. Thus, between A and B, B, is an economic red flag to an entrance clearance officer. Another analogy on financial assessment: Mr. Y a trader, trades in his registered business name, applies for a visitors visa with his family, he enclosed certificate of business registration and bank statement etc. and his application went hitch-free. His friend, Mr. X, owns a business, a duly incorporated limited liability company, let’s call it XYZ LTD. Shareholders and directors are Mr. X’s nuclear family members i.e. wife and children. Mr. X wants to treat family to a vacation abroad so he got his company’s incorporation documents, XYZ cooperate bank statements. XYZ company is worth billions. He confidently submits documents to a diplomatic mission of his choice. Mrs X and children are already daydreaming about upcoming glamourous vacation. Weeks later the package is returned with the rejection letter enclosed; refusal was on the grounds of lack of funds. It could be that at the interview, the entrance officer asks for evidence of fund and Mr. X flashes XYZ business account statement and officer goes, “sorry but these funds are not available to you”. It’s a simple company law principle enshrined in the locus classicus case Salomon vs Salomon: a company is a legal being, different from its shareholders – no one can lay claim to what belongs to another. At best an individual may enjoy some benefits by virtue of his position in a company and such privileges must be expressly stated and agreed by board resolution, during a duly convened board of director’s meeting (irrespective of the fact that directors in this scenario are Mr. X and family/Visa applicants). In nutshell, to present your company’s account for the purpose of proving financial eligibility, documents like, board resolution, letter from the bank where fund is held, and an official letter in company’s letter head are essential. And yet financial eligibility alone, though a very vital tool, does not by itself suffice. In reiteration, there are no static formula, every application is holistically analyzed before conclusion about an applicant’s eligibility is reached. In addition to one’s economic status, below, are two key factors considered during an assessment of visitors visa applicant. In applying for a visitors visa, there must be a clear and definite purpose and documents in support for e.g family visit/business visit. When applying based on your relationship with someone in the host country, there should be an invitation letter from your host and your host must be a national or documented resident of the country. In case of a tourist visa, a well planned-out travel itinerary will suffice for proof of purpose. A diplomatic mission needs to be convinced that a visitor’s visa applicant is not an economic migrant. How? Via an applicant’s ties to his/her home country. Ties can be ascertained by applicant’s personal and financial circumstances. Thus, marital status, responsibilities (family/social), financial status vis-a-vis financial liabilities, career, age, immigration history, are factors considered collectively during an applicant’s assessment. Each of these attributes have its significance with regards to applicant’s eligibility. For instance, a minor applying alongside his parents/guardian has a better standing over an unemployed major sponsored by his parents or invitee. An unemployed, married parent, in some cases is considered eligible over a single, though employed individual. Also some diplomatic missions are not first-time applicant friendly. So here you see an averagely financial applicant considered over a financially buoyant applicant because the former has visited countries the diplomatic mission considered at par with its country while the other applicant may be refused because he/she holds a virgin passport. I Personal/financial circumstances may have changed. III Immigration rules are not static; they are regularly reviewed. In time, we will discuss each visitors visa type disclosing tips and tricks on how to professionally package a visitor visa application. It’s school season! My firm represents and liaises with several international schools. If you have any questions or are considering studying abroad, leave a comment below or email us at attorneychika@gmail.com. We will be happy to answer your questions. There is always something for anyone. Our next post will be on student visas. So look out for it. Thank you all for your comments and shares in our previous posts. Editor’s note: If you are new to the Travel Smart series, please read this interview I had with Attorney Chika to get a background of the wonderful work she does as an Immigration Lawyer based in Nigeria. She writes this series. Countries are structured into geographical locations defined by distinctive borders. Generally, every country has a right to protect its border from outside invasion, threats and interference. Threats may be physical, political or economical. Immigration laws protect the borders. In this way, any country (or person) that breaches the immigration law of another would be seen as a threat and every country is within its right to counter such threat(s). Immigration regulations are also used to foster better trade relationships among countries. It is as a tool to forge alliance with or against countries. For example, a Country can temporarily close its border to another country to persuade an oppressive government to relinquish power. Until recently, U.S. had no diplomatic relations with Cuba for decades. Immigration laws, like every other law, are not stringent. They are reviewed regularly to create, boost or severe interstate relationships, curb imminent economic challenges etc. For example, a country facing a dwindling population may relax its rules to encourage people to migrate to the country. On the other hand, a country faced with an obdurate migrant traffic can put in place strict immigration regulations. A case in point is the recent migration of Nigerian doctors to Saudi Arabia where their services are in high demand. Canada also has an Express Entry program to encourage skilled workers to migrate to Canada. When you talk to a seasoned immigration lawyer, they can look at your station in life and advise you on which country you will have the most success with. Further, the relationship between countries can easily be ascertained by the nature of the immigration regulations between them. Close countries and countries that do not pose economic threat to each other have relaxed immigration regulations among them. To check immigration traffic, economically advanced countries effect strict immigration criteria for the economically challenged countries. While in some cases, it may be unethical and breach of several international treaties (e.g right to family reunion, right of asylum etc) for a country to close its border to another country (except of course countries in hostile relationship) every country nonetheless have a right to protect its border to the best of its ability. Here an applicant is granted audience with officials of the diplomatic mission of his/her interest. An applicant may or may not be required to front load his/her documents before an appointment for an interview is scheduled. Diplomatic missions like U.S use this approach for most of their visa categories. The success of an application depends predominantly on the applicant’s performance during the interview. Where an applicant has front loaded his information/document prior to the interview, for example, it is important that his responses do not contradict information supplied. Applicant’s demeanour is key because more often than not the interview is based more on psychology than logic. We will have a separate post on tips to have a successful interview and the significance of various body languages. As the heading suggests, in this case, an applicant’s assessment is considered on the strength of documents and performance during oral interview. Failure in any part of the interview will lead to a denial of visa application. It is important that when you engage the services of a “consultant” or “an agent,” especially those who are non-lawyers, that you personally research the rules guiding your visa category or at least demand for that information. This is the easiest way to test the competence of your handler. Don’t be an ignorant applicant; don’t be kept in the dark. Insist on full disclosure even if it is “being done for you.” Please insist you be carried along during the whole process. It is YOUR application, YOUR records and most importantly YOUR money. While you can report lawyers to the Nigerian Bar when there is gross negligence on their part in providing you services paid for, non-lawyer consultants are generally not liable or accountable to any regulatory agency. Thank you for your likes, comments and emails. Please keep them coming. For those who wrote us, thank you for your compliments and interest in our firm. We will do our best not to disappoint you. If we are yet to respond to your mail, do kindly resend it. It may have been lost in the deluge of emails, as new mails keep pushing previous ones further down the trail and we may have missed a couple mails. Based on popular demands from mails received, in subsequent posts we will discuss Visitors Visa application. From statistics, Visitors applications form the bulk of applications diplomatic missions receives from Nigerians. In subsequent posts, we will analyze the rules guiding this visa category in the US, UK and Canada diplomatic missions in Nigeria. Till next time, please be travel smart. Anne’s Note: Neither Chika nor I anticipated that our interview last year would generate as much interest as it did. In this feature, Chika takes us through what she has been up to helping people who contacted her with their immigration issues as a result of that interview, and our plans for the future. And we hereby officially launch a series “Travel Smart With Attorney Chika” where she will give us periodic tips on how to successfully travel abroad safe and smart. I hope you enjoy this feature as much as I did. It was sometime in mid-October 2016. I had just got home from a short vacation where I was away from civilization (deliberately) for four days; no phone calls, sms or internet. As soon as I got into town and switched on my phone, what happened next can be best defined in one word: ‘chaos’. Notifications were coming in nanoseconds. My screen was lit in red numerical dots–notifications from my email, apps, sms, missed call icon etc. I couldn’t access the internet on my laptop and my poor phone couldn’t handle the traffic. I was startled. I knew I would be coming back to backlogs but the deluge of messages was strange. I hurried home, got my laptop out to access my mail and delete the “spam mails” that were choking life out of my phone memory so I could access my sms et al. So I got into my email and behold they were not spam after all. They were mails from people–feedback from an interview I granted which appeared in Huffington Post. Since that interview, I have been, and I still am, working with clients with immigration issues who contacted me. With the good comes the bad: I have also had my fair share of tough lashes from people who disagree with what we are doing. Some are of the opinion that I am “promoting brain drain.” Others didn’t quite like the counsel they got. One potential client didn’t take well an honest opinion that given his peculiar personal and economic circumstances at that time, he was not qualified to get a visa to his country of choice. I had advised that he waited a little more and improved his condition to increase his chance of success. However, in the end the good outweighed the not-so-good. Since the interview, the firm has expanded its clientele, increased its network, and potential foreign investors from across the globe have sought us out. Because of what we learned from the experience–that there is a dearth of qualify information out there regarding immigration–my firm has decided to start a campaign to encourage and offer legitimate opportunities to people who may want to leave Nigerian shores for the proverbial greener pastures. We have taken this challenge to ensure that people who are desperate to leave Nigeria are not duped off their hard earned money and given false promises by “agencies” whose sole interest is in lining their own pockets. Just as doctors cannot cure every disease, so it is too that lawyers cannot win every case. First world countries have in place strict immigration policies to help protect them from being overwhelmed by economic migrants. The effect is that for us in third world countries, not everyone will qualify for certain categories of visas to visit or reside in developed countries. A good lawyer will tell you from the get-go the likelihood of success of your visa application and give you other options, including other countries, that may be a better fit given your standing in life. For example, someone who cannot afford the high cost of education in U.S. and Europe can be offered opportunities in South Africa and Ghana. On whether or not our firm is doing the country ill by promoting brain drain, I have this to say: I once used to discourage migration. I disagreed with my friends and families who considered migration. Then, I felt migration was the height of unpatriotism. But in the course of practicing immigration law and being privy to clients’ unique circumstances–cases that migration is the only option, for example, family reunions, economic opportunities, access to better medical care to save lives etc.–my ideologies evolved. While I still do not support permanent migration, I encourage traveling and temporal migration especially for study, family reunion and medical care. The present state of Nigeria education and medical system is anything but encouraging. Traveling to other countries is not a luxury; it is educative, hence imperative. Because there is an upsurge of socioeconomic challenges in Nigeria with the political class bedeviling the future of masses with farcical policies, when Nigerian citizens travel abroad, a mental evolution from associating with individuals from saner climes is triggered, and when they come back home, they demand that our leaders do better. I will elucidate on this properly in a separate post. In summary, I see migration now as a tool and not an end. The experience I gained from that one interview has been exciting, draining and most of all humbling. Some cases we handled gives credence to biblical phrase “ My people suffer for lack of Knowledge”. Nigerians need as a matter of urgency a reorientation about migrating/travel ling especially on the “how” to go about it and the reality of what to expect for “when”. Since it all started through the author of this platform, Anne Mmeje, when she published our interview on Huffington Post, another platform she contributes to, we, not wanting to be like the biblical nine ungrateful lepers, have decided to partner with her in our campaign to enlighten Nigerians on migration. Our firm will use Anne’s blog as a medium to reach out to people who are hungry for information on immigration. We will do this by publishing educative contents about various country visa types and how to meet their requirements. We will also give tips on documentation/packaging. We want the topics to be open and interactive via the comment session, so we will give readers opportunities to write us about their traveling/immigration inquiries or challenges. In all, our aim is to promote what we term “Travelsmart Consciousness” and to provide travel aids to eligible individuals and help non-eligibles find other alternatives to prospering, even if that means staying back home. We would rather people who are struggling economically save the little they have and invest it here in Nigeria than have them waste it on what is at best a pipe dream. We will also create awareness on the dangers of illegal migration, challenges illegal migrants face and why we discourage same. Please note while information and answers giving during interactions on the blog is free, any individual who demands for personal service i.e individual assessment and visa packaging assistance will be charged a professional fee. To help us know what issues you would like us to address, we request that you give us feedback in the comment session. You can also write to us on countries of your interest and visa categories you wish us to discuss by sending us an email at attorneychika@gmail.com.